Patented heat spreading technology heats evenly! Stop messing with hazardous heating belts and big bulky warming ovens. powerblanket takes the hassle out of heating and warming your drums and barrels. Blankets can be ordered with built-in thermostats of 90°, 110°, 130°, or 160° and offer adjustable clip straps to ensure proper fit for larger and smaller 55 gallon drums. Our thermostats will ensure you never over or under heat your materials again. Each barrel-blanket heater has a 6 foot male & female cord allowing 4 blankets to be plugged together on a single 20 amp outlet. Powerblanket Tote Heaters are designed to warm, insulate, and protect temperature sensitive materials in ALL WEATHER CONDITIONS. The new TH330 tote heater is ideal for heating chemicals, rubber, epoxy, resins, water, and other temperature sensitive materials. Includes a GHT2000 adjustable thermostatic controller. Think of it as our barrel heaters on steroids. Never let cold weather slow you down again! Custom powerblanket Tote Heaters available for almost any size or shape tote or large pallet. Call us at 925-706-7433 for a custom price quote. The powerblanket™ Hot Box Heaters are an innovative, highly efficient and low wattage heating system for pallets and bulk materials. The patented heat spreading technology and structured box design creates a controlled environment perfect for heat soaking many temperature sensitive materials including rubber, epoxy, resins, and asphalt. 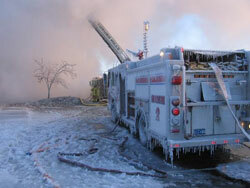 Avoid costly waste and cold weather delays. Get powerblanket! Keep temperature sensitive materials warm, including bagged asphalt, resins, caulking, paint, epoxy and more. The powerblanket HP2000 Hot Pocket keeps heat soaked materials warm during transport, helping eliminate waste. Wrap your propane tanks and other gas cylinders in a powerblanket and maximize your gas mileage. Keep gases at optimal temperatures and reduce waste. Enhance performance and increase efficiency. Everyone knows when working with gases, each gas has its sweet spot. In a liquid propane (LP) tank for example, part of the volume is occupied by liquid and part is occupied by gas. The pressure of the gas is governed by the temperature of the liquid. Powerblanket GCW Gas Cylinder Warmers help heat and insulate propane to achieve maximum safe output. Electric powerblanket motor warming and equipment heating blankets protect machinery from freezing in cold winter weather. Engineered to keep engine fluids warm, hoses & pipes safe, and machinery tubing from cracking and braking. Thousands of customers use our blankets to protect their outdoor appliances, equipment, and machinery in harsh winter climates. Just roll it out, plug it in, and watch how powerblanket's patented heat spreading technology heats and protects on contact. The powerblanket is winterproof, waterproof, and virtually indestructible. Keep motors and equipment working all winter long with the powerblanket. 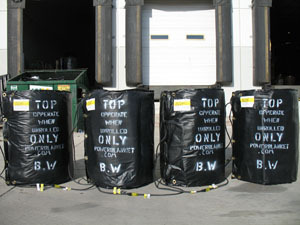 USE POWERBLANKET ON OUTDOOR EQUIPMENT INCLUDING OIL RIGS, PIPES, AND MACHINERY. Thaw 8"-18" of ground overnight! Power with any 20 amp outlet. 8 blanket sizes to choose from. Powerblanket thaws and heats frozen ground for concrete preparation, grave site excavation, sub-roughs, footings and other cold winter weather construction applications. Melt ice & snow and thaw driveways overnight. PowerBlanket will thaw frozen ground up to 5000% cheaper than other conventional ground heating systems (including propane, glycol, etc.). Quit wasting time and money on big bulky systems that are difficult to manage and expensive to operate. Just roll out the PowrBlanket, plug it in to any 20 amp wall outlet or generator, and stop worrying. Patented technology evenly distributes radiant heat for fast thawing & curing. Male & female ends allow you to daisy chain dozens of blankets together to cover huge areas all at once if needed. ExtraHot models available for even faster thawing. Never let cold winter weather slow you down again. Get PowerBlanket! POWERBLANKET outdoor heated blankets melt ice and snow fast. Model #EH0405 delivers targeted heat spreading technology directly to troubled spots. 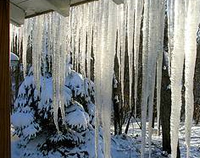 Keep roof and ground areas free of snow and ice all winter long. Powerblanket thaws frozen pipes fast and without the need for propane burners or bulky thawing equipment. Powerblanket is easy to own and operate. Simply plug powerblanket into any wall outlet or generator and let the thawing begin. It's fast, it's safe, and only pennies a day to operate. Drop it, Roll it, fold it, kick it - You cannot hurt the powerblanket! Designed for cold weather applications, the powerblanket safely warms pipes and melts ice quickly. Powerblanket heat spreading technology is patented, proven, and less expensive than conventional thawing methods.